So a quick note regarding Dropbox running on ArchLinux with Nvidia drivers. Since I use KDE Plasma 5 that doesn’t show system tray icons of some applications that have not migrated to the new system tray protocol, I didn’t notice that after upgrading Dropbox it stopped working. So the error is related to the Software Raster library, that I don’t have because I’m running Nvidia proprietary drivers. Quite simple, just remove (backup) the libGL.so.1 library that exists on the Dropbox directory. After the removal, Dropbox starts just fine. My home desktop PC, was running since 2009 the Kubuntu distribution. I’ve never reinstalled it and did always the upgrades from 8.10 to 9.04, 9.10 and so on until 14.04. Almost six (!) years with no virus, trojan horses, and a single initial installation. I’ve upgraded through the years the KDE desktop since the ill famed initial 4.0 release, to the latest 4.6 release. But things where starting to go awry… At the beginning I had a ATI 4870 graphic board, but ATI dropped support for it on Linux (and Windows) and since I had so many troubles with the proprietary driver, and to add it up I had no support for the board, I sold it and bought an Nvidia GTX660. But with both graphic boards, I had suffered from a long time problem: I could only do a sleep/resume a number of times before the system hanged. The symptoms starting from loosing network connectivity and then restoring right back, and some cycling of these symptoms to a complete lockup. At first I thought that was due to the network driver used by my motherboard, a Asus P6T with a Realtek RTL8111/8168/8411 board, but with the correct driver for it, the issue continued. Booting up was a painful two/three minute wait from BIOS to desktop. But after a while I could pin point my issues not to the network board but to the Xorg and video driver combination. Some EQ buffer overflow, hanged X, and finally the machine. Ubuntu and Kubuntu based distributions have PPA’s repositories where some alternative software and versions of mainstream software are available. I had trouble with some of these alternative PPA’s when upgrading, and had to remove them (with ppa-purge) to be able to upgrade the Kubuntu distribution. Anyway, there is an PPA, xorg-edgers, where alternative and more recent versions of Xorg Software and Nvidia drivers are provided and that almost solved my sleep/resume problem. The problem was that after adding this PPA the Ubuntu/Kubuntu nvidia driver and the Xorg-edgers driver, after updates the X server was unable to find the nvidia driver, despite being installed, and had to reinstall the driver again to get my desktop working. I’ve being testing Arch Linux on my work laptop for almost an year with great success. I’ve chosen Arch Linux because I didn’t had to loose an unknown number of hours per year upgrading to the next distribution version, and an rolling release version makes more sense. And Arch has the greatest Linux Wiki out there even solving problems that happen on the Ubuntu/Kubuntu line, and also mainly there are only one (well two) repositories. No PPA’s mess. So I completely moved all my systems to Arch Linux, and my sleep/resume issue is 100% solved. My desktop computer has an Asus P6T motherboard. This motherboard only has SATA II (SATA 2) ports. Is it worth to use an SSD on such a board without upgrading to a SATA III board? The answer is YES. If you have a SATA II based motherboard AND not buying an SSD because of that, do not wait any more. Buy it now. It is totally worth it. Make sure that the infinality modifications are installed: https://wiki.archlinux.org/index.php/Infinality. Make sure that you update. Make sure that the DPI detected by your X server are correct for your monitor. Install xdpyinfo with pacman -S xorg-xdpyinfo. Figure out what might be your monitor dpi using this site: http://dpi.lv/ . Execute xdpyinfo | grep -B2 resolution and see if are similar. If not you need to set the correct dpi either in xorg.conf or in the Kde settings. 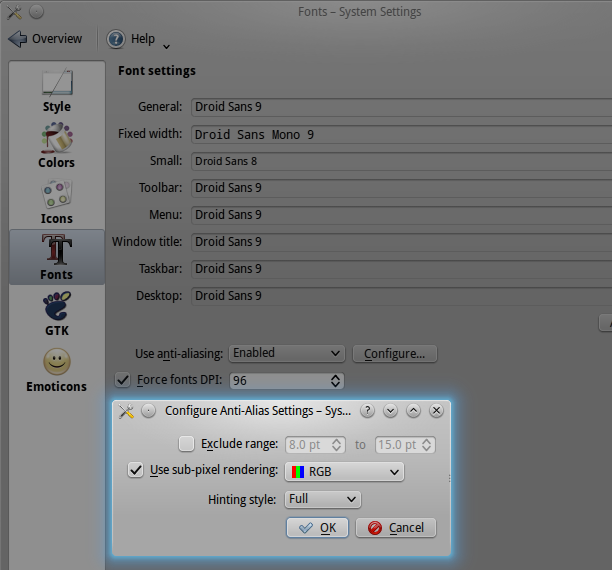 While the above settings make my fonts look good, the taskbar fonts where awful and took me a while to figure out that was not the dpi settings but the Desktop Theme. To solve this first install Krita with pacman -S calligra-krita . 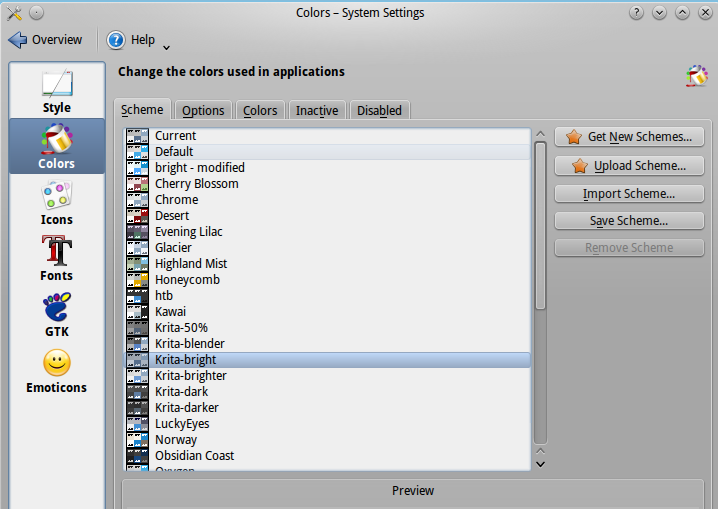 This will install the Krita color themes that are, in my opinion very good. 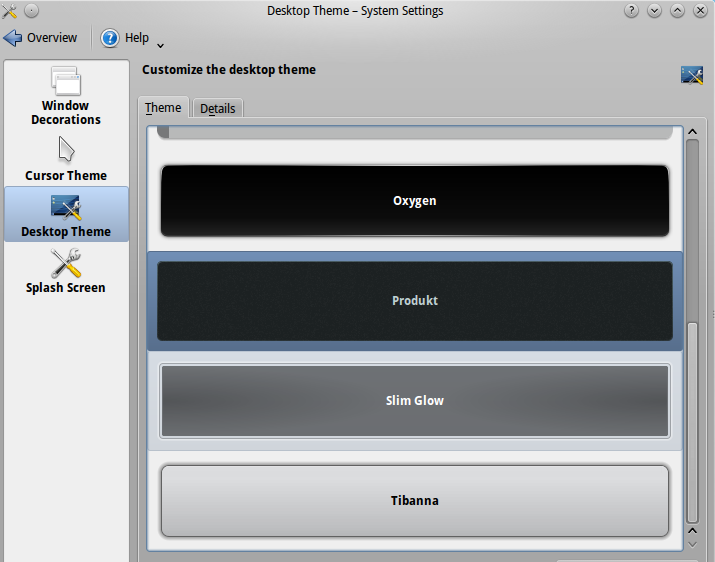 And on KDE System Settings -> Workspace Appearance -> Desktop Themes select Get New Themes and get the AndroidBit theme. The Arduino IDE is the tool of choice for building and programming for the Arduino platform. It has all that is need for casual programming, namely a simple way to choose and select the Arduino board and serial port, a simple interface, and a simple editor. But those of us used to other tools for programming, like NetBeans, IntelliJ IDEA (I use it as the Android Studio version) or Eclipse, can find the editor lacking in little things that makes programming easier. Anyway I was able to use NetBeans for programming and deploying arduino sketchs, with a great feature that is/was command auto completion for the Arduino C “language”. But Netbeans is big, and all it does is to call the Atmel tools for compiling and uploading sketchs into the arduino boards. So I’m a KDE user, and KDE has a great extensible editor named Kate. Why not use it for programming for the Arduino? As I said, Kate is a powerful extensible editor and there are two plugins for making Kate “friendlier” in this task as a replacement for the Arduino IDE. Just download the ArduinoKate.xml file and as root copy it to the /usr/share/kde4/apps/katepart/syntax folder. Just make sure that on your distribution that the path is correct. Now if opening an .ino or .pde file with the Kate editor, we should have syntax highlight. Next we need to download an Arduino Make file from https://github.com/sudar/Arduino-Makefile. Just download it and unzip it to a directory that won’t be deleted or moved. You also need the Arduino IDE to make this work, as this make file will get the tools and libraries from the Arduino IDE installation directory. Just launch now the Kate editor and goto Settings->Configure Kate->Plugins and enable the Build and Project plugin. Save the file. This makefile is for the Arduino Uno. To compile for other boards, on this directory and with this make file saved, just run the command make show_boards to see the available boards. Then change the BOARD_TAG appropriately to your board. For example, for the Arduino Mini Pro 5v the BOARD_TAG is pro5v328 and not uno. "name": "My Arduino Project Name"
The JSON “name” tag will define the name that shows up at the Kate Project dropdown box selector. 4) If using Git (as I do) just add a .gitignore file where the *.o and *.d files are ignored. Create your main.ino file and add code. To compile, just go to Build->Build Default Target. This is equivalent to Verify on the Arduino IDE. To upload, on the Build plugin window, just select (or add) the make upload option, and the Makefile will upload the sketch/program to the board. If any errors happen, clicking on the Build plugin output tab, on the lines with errors and line numbers, will jump to the exact location of the error. For more information refer to Sudar documentation for the Makefile. I’m running a Monit based monitoring solution, but I do not have an email server (that I can use), so when something goes wrong and Monit Alerts is raised, I have no way receive a notification that something is wrong. My solution uses a python based network server running on my desktop listening for messages, and a python client deployed on the Monit server that sends messages, when called. # Read the message that comes from the monit server. Notify.py receives a message passed as a command line parameter and sends it to the NotifyServer running on the desktop machine. The notify.sh shell script is a wrapper for the Monit server to call the monit.py script. Keep in mind that you must use absolute paths in every single file, otherwise it won’t work. check program System_status with path "/home/monitor/ShMonitor/SystemStatus.sh"
if status !=0 for 15 cycles then exec "/home/monitor/monit/bin/notify.sh SystemStatus_Problem"
I added the for 15 cycles to avoid being flooded with notifications while I solve the issue… But it really depends of the monitoring pooling cycle. Adjust as required. One of the softwares available for the Synology is Cloudstation that mimics Dropbox functionality but with your own server (in this case your Synology device). For the Cloustation server there are several clients available, and one of them is CloudStation for Linux. But I run Kubuntu version of Ubuntu with the KDE desktop, and during installation of the CloudStation for Linux/Ubuntu, one of the installation steps by the Cloudstation install program is to run apt-get where Nautilus, Brasero and a lot of other supporting libraries are required to be installed. But, as I’ve found out, those packages are only needed for file manager integration, not for the functionality of the CloudStation software. So just answer NO to the request of packages (you may want to keep a copy of the package list for future installation), and let CloudStation install. On my KDE 4.11.3 it CloudStation works fine, and it has the Status icon on the Systray, without the required Nautilus libraries. Of course there is no Dolphin integration. To change it’s easy. Just go to System Settings and Default Aplications. Choose File Manager, and there choose your File Manager of preference. Despite Kubuntu 12.04 being a LTS release, and after some weeks upgrading to 13.04 on my personal desktop computer, I decided to do the same on my Work Laptop. First the upgrade from 12.04 to 12.10 deleted a bunch of packages, by my command 😦 and I ended up with no graphical display… A quick look at Xorg.0.log file showed me that my Xorger’s driver for my Intel graphic card was gone. Anyway, I’ve installed the xservers-xorg-video-intel package and proceeded to upgrade to 13.04. At the end despite having a graphical desktop, after login on KDE, a qdbus error appeared… qdbus package was missing… (apt-get install qdbus). And finally, DNS settings from my DHCP servers didn’t worked, I had to manually add the dns servers IP to resolv.conf… This issue was also a missing package, namely dnsmaq. After adding up the nameserver 127.0.0.1 to my /etc/resolv.conf file, everything is up….